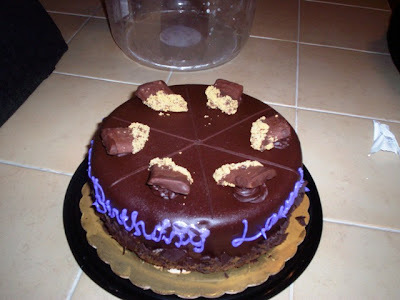 Usually for my birthday, I like to have an ice cream cake from Baskin Robbins. However, this year I decided to try one of Cold Stone Creamery's signature cakes - the Coffee House Crunch. As described on the Cold Stone Web site, this cake consists of layers of moist devil's food cake, coffee ice cream, and Heath bar pieces wrapped in a rich fudge ganache. 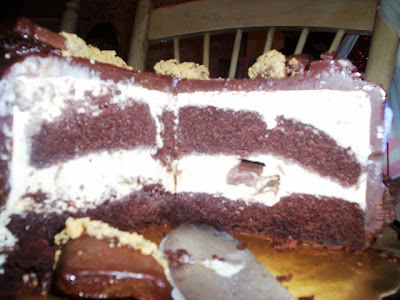 Now everyone that reads New England Bites knows that Mom is a big fan of coffee ice cream, however, I am just as big a fan, and couldn't wait to dig into this delicious-sounding cake. Mom called in an order to the Seekonk, MA, location last Thursday, and the staff was going to have it ready for pickup by 2 p.m. today. Because we had gotten a late start, and because we stopped for lunch at the Old Country Buffet (housed in the same parking lot), we didn't hit Cold Stone until about 5:15 p.m. Cold Stone is set into a large plaza between a Payless ShoeSource and a GameStop. Unless you're specifically looking for it, you may actually miss the sign. I had to do a double take myself when looking for it for the first time. 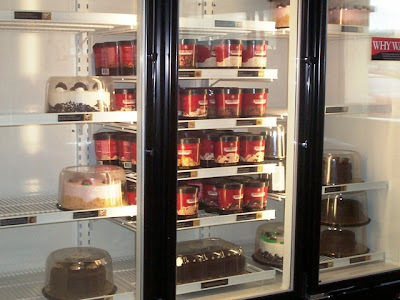 Once inside, we were greeted by a large freezer filled with their signature ice cream cakes. The prices of these cakes are a little outrageous. The 4" petite round is $7.50 (serves 2), the 6" small round is $23 (serves 8), the 8" medium round is $35 (serves 14), the 8x12" medium rectangle is $47 (serves 25), and the 12x18" large rectangle is $70 (serves 50). The list of signature cakes is quite extensive, consisting of creations like A Cheesecake Named Desire, Cookies & Creamery, Peanut Butter Playground, and Mmmmmmint Chip. We briefly waited at the counter before being noticed by a friendly server. Mom explained that she was picking up a cake, and the server quickly went in the back to retrieve it. Seconds later, a second server came over and asked if Mom needed help. Mom, again, explained that she was picking up a cake, sending the second server off in the back to search for it. Considering we were the only two people in the store, it was strange how confused they had gotten. 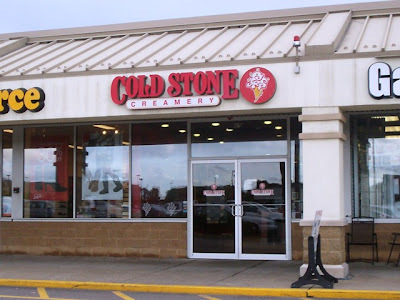 Mom and I have been to Cold Stone a few times, but we have never been to this location. We used to make the drive to Newport, RI, but it's nice to have a Cold Stone a little closer to home. Both locations are exactly the same in setup, leaving very little room for customers considering the store, at least the Newport location, is always quite busy. 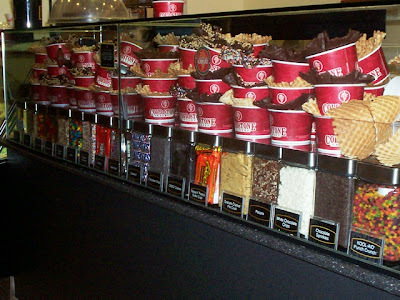 The glass counter is lined with Cold Stone's endless variety of mix-ins, ranging from different fruits, nuts, chocolates, and assorted goodies like gummy worms and peanut butter cups. Before choosing an ice cream from the long list of flavors, and picking your mix-ins, you have to specify which size you want. The sizes are Like It (5 oz. ), Love It (8 oz. ), and Gotta Have It (12 oz.). You can also choose from one of Cold Stone's many creations, such as the Apple Pa A La Cold Stone, Coffee Lovers Only, Nights in White Chocolate, The Pie Who Loved Me, Birthday Cake Remix, and several others. You can also custom order your creation. After your server is done gathering all your ingredients together, they slap it all down on a frozen granite stone and start the mixing process. Like a paint brush on a plain canvas, each fold brings in an array of color and texture to the sweet dessert. I love the way they do this because instead of just toppings, the add-ins really become a part of the ice cream. With every bite, there is a little something extra. The prices, however, are a bit shocking. I can tell you that Mom paid over $13 for two large signature creation cones at the Newport store. A bit insane, don't you think? Cold Stone also offers shakes, smoothies, and 32 oz. Grab-N-Go quarts of their signature ice cream creations. As if paying $13+ for two ice cream cones isn't unsettling enough - they sing at you. Although no one sang on this occasion, I've unfortunately been at the Newport location during one of their "shows." Since I detest that sort of thing, I decided to wait outside for Mom as the servers belted out some stupid tune. Apparently they're known for the random acts of song, but thankfully I wasn't subjected to anything of that nature on today's visit. 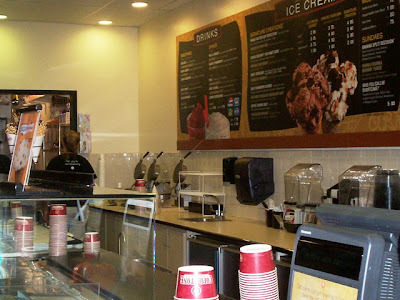 Cold Stone is mostly decorated with pictures of their signature creations, and there is a large display menu above the counter that lists all of the prices for their treats. The Seekonk location was very clean, and the glass along the freezer doors and the counter tops was spotless. A few minutes went by before two servers brought out my birthday cake. It was beautiful. Mom didn't notice where they had written "Happy Birthday Laura," and instead of showing her where they'd written it, the servers just said, "Yeah, it has writing on it." Thankfully I noticed the purple writing before the cake was placed into the large Cold Stone bag. The total came to $35. After paying, I told Mom that for $35, the cake had better be the best ice cream cake we have ever tasted. When we got home, Mom got out a large knife and began to slice through the ganache. Although there were some pre-existing lines already drawn into the cake, we assumed they were just decorative because cutting along those lines would have given you a humongous piece. Mom cut each "piece" in half, and that was just enough for a slice. Topped with large pieces of Heath Bar, this cake was outstanding. The chocolate cake was surprisingly moist considering it was made to remain frozen. The coffee ice cream with the Heath pieces was smooth, creamy, and delicious. The only downside was the ganache - it was way too thick and sweet. I found myself eating around the ganache, and for $35 we shouldn't have to leave pieces of the cake behind. All four of us - Mom, Dad, Mallory, and myself - thoroughly enjoyed this cake. So far, my 29th year has started off with a bang, and it's all thanks to my Cold Stone Creamery cake.